Arun Devaraj using an atom probe tomography system, or APT, one of the specialized instruments at EMSL, to create an atomic map of how individual atoms in a titanium alloy are arranged. Pacific Northwest National Laboratory materials scientist Arun Devaraj was featured in Lab Director Steve Ashby's monthly column in the Tri-City Herald. In "Making better stuff," Ashby described materials research at PNNL. 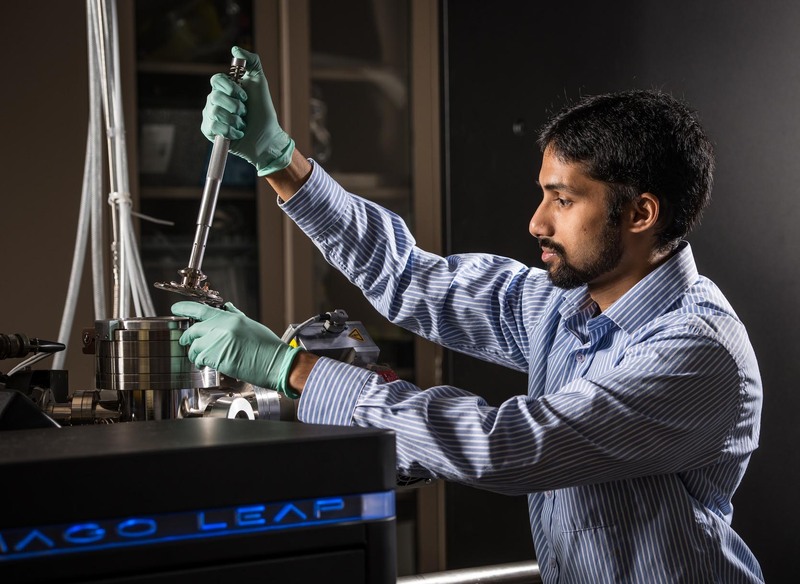 Arun and his colleagues at PNNL use atom probe tomography, a high-resolution 3-D imaging capability, to study automotive and energy materials. The insights about these materials and their behavior can help scientists and engineers achieve lightweight vehicles and help develop new energy storage technologies. Arun began working at PNNL as a postdoctoral researcher in 2011 and became a senior research scientist in 2012.